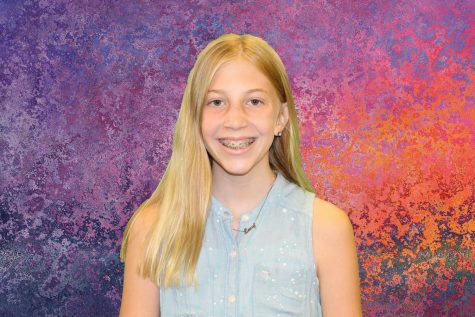 Lucy is an outgoing, funny, and caring seventh grader. She is a Broadway addict and professional procrastinator. When she grows up she wants to be an actress or do something with animals. Her favorite foods are queso, chocolate, and Ben and Jerry’s Ice Cream. She loves to play pickle ball, watch football, and watch Netflix (especially Gilmore Girls and Psych). Lucy did Journalism because she really likes writing and wants to do broadcasting. She loves, loves, loves dogs and has two adorable dogs, named Ochi and Chloe, that she loves to death.